Yay for two of my Old Navy purchases in the same outfit! 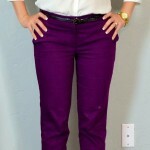 The slub sweater and chambray shirt are great neutrals to pair with my fun purple pants. Here are the Purple pants 9 ways. 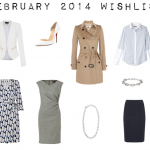 Also don’t forget – 3 days left to enter to win one of three $100 gift cards! The combination of chambray and that burgundy/purple is really pretty! I'm not normally a pants-person for work (if I can't wear jeans, I'll choose a skirt/dress any day) but now I am really tempted to check out the Express or Target pants. Love this!! 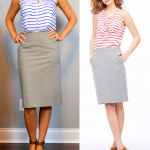 What do you think about the lighter chambray color vs the darker colors? The purple pants are such a great shade! The chambray and cream sweater look beautiful with them! Those pants are such a pretty shade of purple! I love the way they look with the cream/beige sweater. 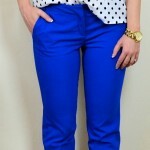 I love the color of the pants! Thanks! I love my darker chambray shirt. I think I understood how to wear it better because it is close to denim color? But because I wore it so much I'm excited to have a lighter version to mix in! Kendi is so cute! She's great inspiration! Thanks! 100% bought these 2 ON tops based on this outfit and am wearing them right now! Yay! Sometimes Old Navy just saves the day!